Despite having lived most of my life behind the Orange Curtain, I find that the area is sorely lacking in quality restaurants. Had I judged Taco Maria by name alone I would have pegged it as a run of the mill tacqueria, fortunately one look at the menu quickly dispels that misconception. In fact, there isn't a single taco anywhere to be found on the menu, instead diners are presented with a 4-course menu with two options for each course. Housed in The OC Mix Mart within SoCo (South Coast Collection), Taco Maria is right at home in one of Orange County's most progressive culinary locations. 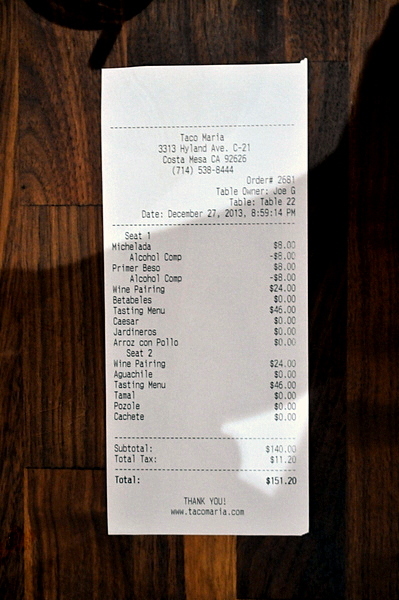 The restaurant is a brick and mortar offshoot of the Taco Maria truck opened Chef Carlos Salgado. An OC native descended from restauranteurs, Carlos honed his skills up north with long stints at both COI and Commis up north before returning to Orange County. While at the Michelin starred restaurants Salgado made the transition to pastry, which makes the switch back to savory something of a surprise. 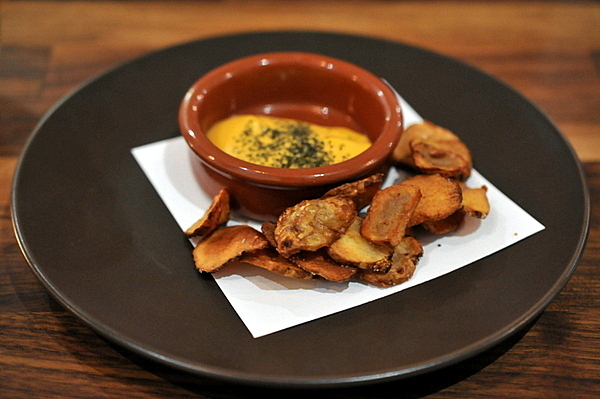 The meal began with a plate of sunchoke chips, think potato chips with a mixture of sweetness and bitterness to compliment the savor. The aioli was maddeningly addictive, with a hint of meaty savor that just barely registers, I found myself eating chip after chip in search of that elusive flavor. I've never been fond of salad, that goes doubly for a beet salad but this was one of the strongest courses of the night. 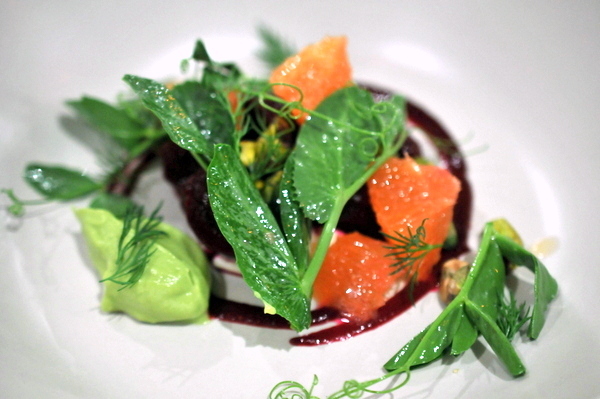 Instead of being all about the beets, everything on the plate had a purpose and a place. The resulting salad celebrates the sturdy texture and sweetness of the beets but working in concert with the gentle gamy flavor of the fromage and the vegetal levity of the pea tendrils. 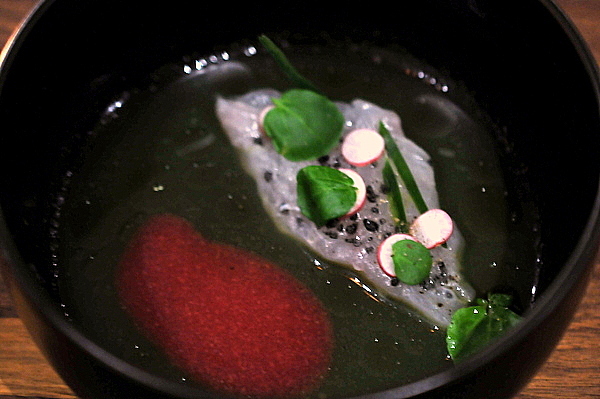 The second of our initial courses is Mexico's answer to Ceviche. The key difference is that in aguachile, the fish is cured only briefly in chili-lime marinade which necessitates the use of fresher seafood. This dish bursts with different flavors most obvious are the tart astringency of the marinade and jammy sweetness of the guava; though the jarring contrast could get a bit disconcerting at times. The olive oil adds a light fruity flourish while the Serranos provide a fiery heat that gives the dish its name. Most people probably wouldn't consider the Caesar Salad as Mexican food, but the salad's creation is generally attributed to Caesar Cardini an Italian restauranteur who invented the salad in 1924 while working in Tijuana. 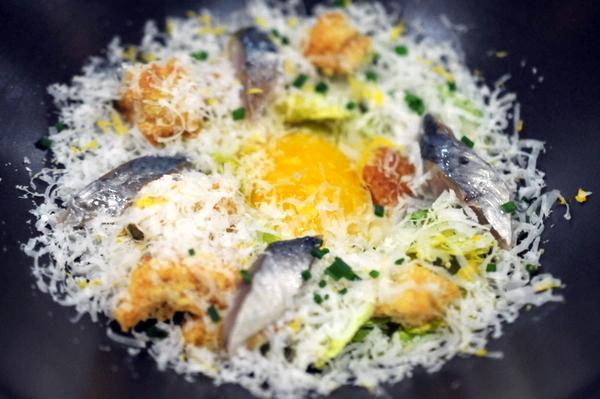 The sardine has a oily relish twang reminiscent of Mackerel nigiri while the creamy egg yolk ties the whole dish together. Salgado's deconstructed Caesar salad captures the essence of the original but the added depth made this my favorite course of the night. This was probably the most challenging dish of the night for me. 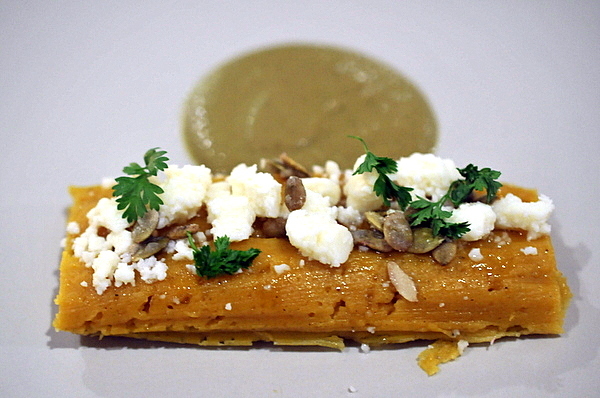 Not much of a tamale fan to begin with, I could appreciate the precision that went into this preparation, but I struggled further with the inclusion of kabocha which gave the dish a monolithic overarching sweetness. Arroz Jardinero or Gardiner's Rice is a South American dish of rice served with assorted vegetables. 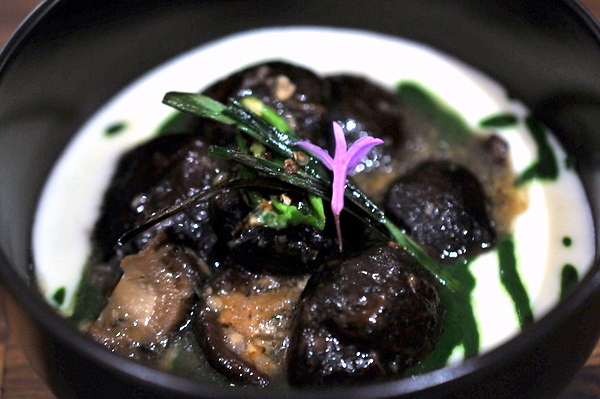 Chef Salgado replaces the rice with a puree seasoned with creamy queso Oaxaca; the perfect base to show off the earthy heft of the mushrooms coupled with the peppery bright green flavor of the stinging nettles and shishito peppers. Pozole dates back to pre-Colombian Mexico, and is a stew of meat and hominy traditional served on special occasions. 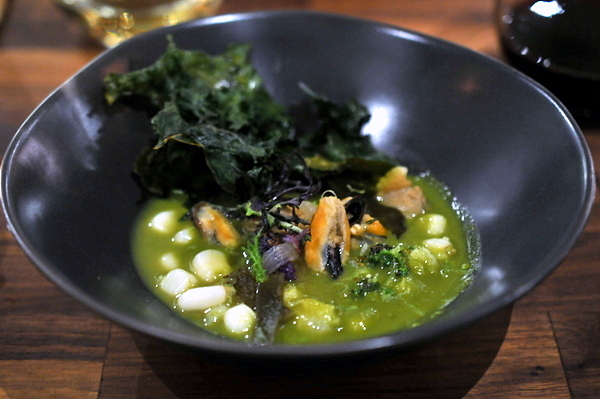 The large white hominy kernels are dense, starchy, and sweet while the accompanying broth is infused with a deep saline flavor from the shellfish as well as a bright citrus tang. One of the final savory options is a gentrified take on chicken and rice featuring a beautifully moist chicken breast wrapped in a thin layer of crispy decadent skin. 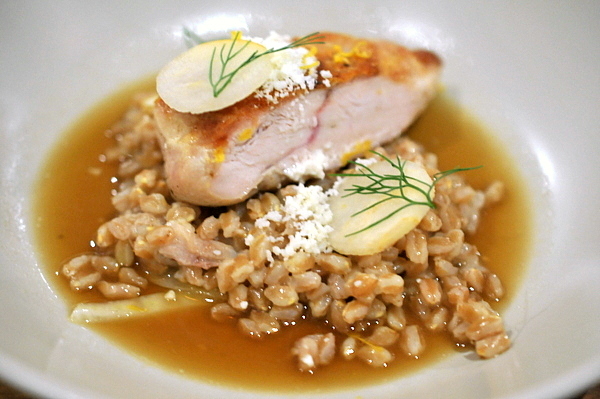 The interaction of the chicken and farro exhibits a slight caramelized character brightened with a hint of licorice and a light sweet crunch from the pear slices. The final course was the most elegant presentation of pork and beans that I've ever tasted. 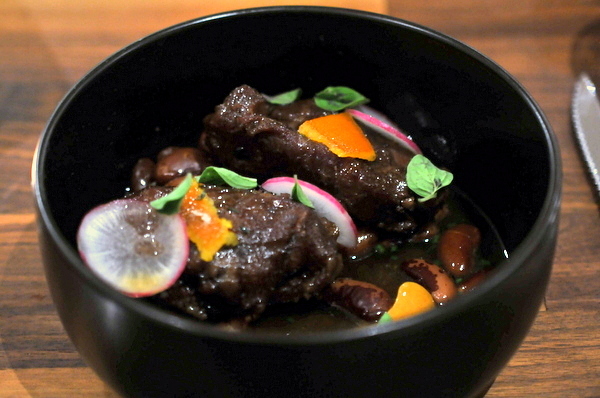 Centered around two chunks of pork cheek braised to tender perfection, the dish exudes a rich porcine flavor that permeates the starchy cattle beans. My one issue with the dish is the heavy application of orange zest which overwhelmed the cheek at times. With the meal concluded an nowhere near satiated we resorted to ordering off of the kids menu. Ironically this was probably the only dish that most people would easily identify as Mexican. 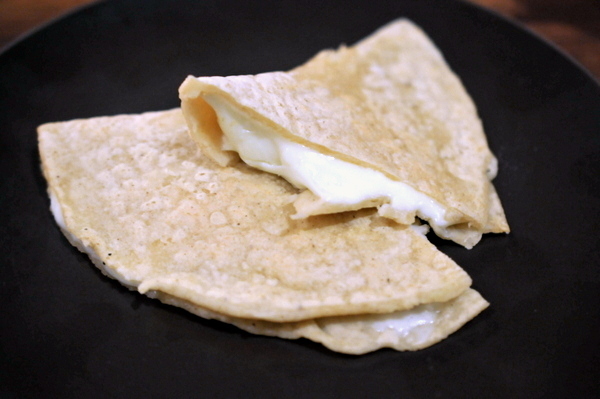 Most quesadilla's are all about the cheese, the gooey consistency and rich flavor with the tortilla being something of an afterthought. Here the fragrant aroma of corn is particularly stark against the mild creamy queso. The lack of a dessert menu which is particularly surprising considering that Chef Salgado's background in pastry. 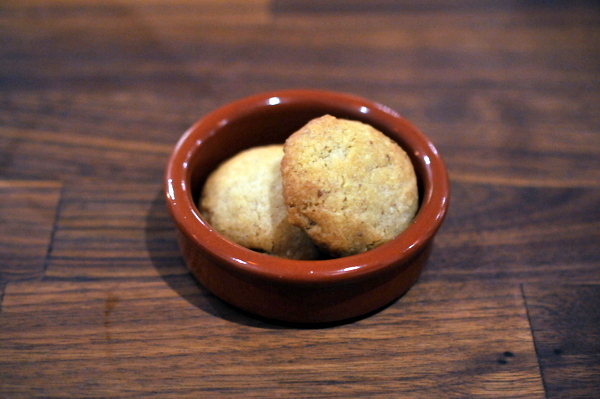 Chef Salgado promised desserts were in the works but for now we were given a pair of cookies in lieu of composed dessert courses. I didn't quite catch the name but they sure tasted like shortbread cookies. Chef Salgado's modern take on Latin cooking shows a level of dynamism, creativity and sophistication rarely found in Orange County. From start to finish this meal far exceeded my expectations; I only hope other OC residents realize what a gem we have in Taco Maria. It was a mix of vermouth and lemon soda so light and refreshing with a touch of botanicals and vinousness. BTW the place is well worth a trip.